Marshal Pietro Badoglio, who was a general in the Italian Army in both World Wars and became Italy’s wartime prime minister after the fall of Mussolini, was born on this day in 1871 in the village of Grazzano Monferrato in Piedmont. He was Mussolini’s Chief of Staff between 1925 and 1940, although his relationship with the Fascist dictator was fractious. Indeed, he ultimately played a key part in Mussolini’s downfall in 1943, encouraging the Fascist Grand Council to remove him as leader and advising King Victor Emmanuel III in the lead-up to Mussolini’s arrest and imprisonment in July of that year, after which he was named as head of an emergency government. It was Badoglio who then conducted the secret negotiations with the Allies that led to an armistice being signed barely five weeks later. However, historians are divided over whether he should be seen as an heroic figure, in part because of his role in the disastrous defeat for Italian forces at the Battle of Caporetto in the First World War, at a cost of 10,000 Italian deaths and 30,000 more wounded. Badoglio hailed from a middle-class background. His father, Mario, was a small landowner. He trained at the Royal Military Academy in Turin. After completing his studies, he served with the Italian Army from 1892, at first as a Lieutenant in artillery, taking part in the early Italian colonial wars in Eritrea and in Libya. 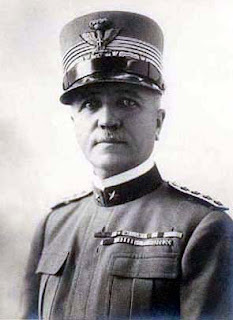 Early in Italy’s participation in the First World War, he was elevated to the rank of Major General following the capture of Monte Sabotino in May 1916, which was attributed to his strategic planning. The Battle of Caporetto in October 1917 went less well, however. He was blamed in various reports for poor decision-making with regard to the forces under his command. However, by the time a commission of inquiry looked into his role Mussolini had taken control and, having identified Badoglio as someone he wanted on his side, is thought to have ordered all references to Badoglio to be excluded from the report. Badoglio was uneasy, however, with the aggressive Fascist stance on foreign policy issues and, in an effort to distance himself from Mussolini’s ambitions, which he felt were unrealistic, asked to be assigned to an ambassadorial position in Brazil. However, Mussolini summoned him back and offered to make him his Chief of Staff, a position Badoglio felt unable to refuse. He was made a Field Marshal in May 1926, governed Libya from 1928 to 1934 and assumed command of the Italian forces during the invasion of Ethiopia in 1935, capturing Addis Ababa, the capital. The conflict was notorious for the use by the Italian side of mustard gas, in contravention of the Geneva Protocol of 1925. Blame for this was laid at the feet of Mussolini, but some claim Badoglio had already ordered its deployment before authority was given. Badoglio joined the Fascist Party but his relationship with Mussolini began to fracture soon after the Ethiopia war, in part because the dictator wanted to take personal credit for the operation’s success. Badoglio opposed Italy’s involvement in the Pact of Steel with Germany in the lead-up to the Second World War because he had doubts about Germany’s ambitious military objectives, yet led Mussolini to believe the Italian army was capable of playing a significant role. 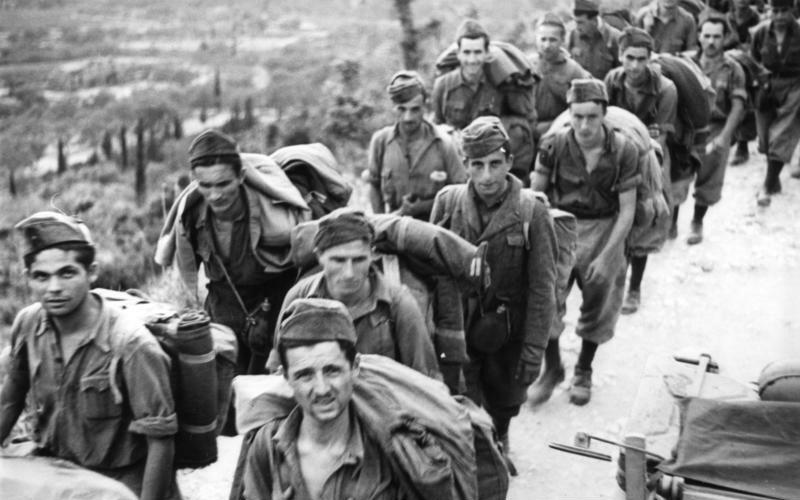 Indeed, the invasion of Greece by Italian forces in 1940 went ahead, seemingly with Badoglio’s endorsement. The campaign was a disaster for the Italians, however, with considerable losses in personnel and equipment. 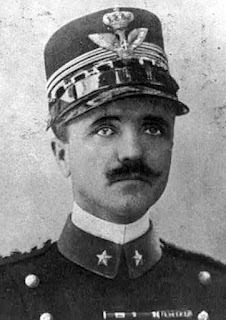 Badoglio resigned as Chief of Staff soon afterwards. As the Second World War as a whole became one in which Italian sacrifices looked increasingly likely to be pointless, Badoglio positioned himself with those who believed the only hope for Italy was to remove Mussolini. He began to be involved in talks with other prominent Fascists about how this might be brought about and made it known to Victor Emmanuel III that he would be willing to lead an interim government if Mussolini was overthrown. In the event, he was installed as prime minister on the day Mussolini was arrested. However, he attracted criticism for allowing news of the armistice to come out on the Allied side before his own troops had been informed, appearing to put his own safety ahead of Italian personnel. Right up to the moment it was announced, Badoglio had been reassuring the Germans that Italy remained a fully committed ally. When the armistice was revealed, many Italians were still fighting alongside German forces, unaware that their status had suddenly changed to enemies. Badoglio and Victor Emmanuel, on the other hand, had removed themselves to safe locations in the south of the country, avoiding capture. Badoglio dissolved the Fascist Party, and Italy declared war on Nazi Germany. He was never a popular figure, however, as the political climate changed and in June 1944 he resigned, giving way to the left-winger, Ivanoe Bonomi. Badoglio retired to his home in Grazzano Monferrato, which by then had changed its name to Grazzano Badoglio in his honour. He remained a figure of influence amid increasing tensions over the Soviet Union and managed to convince the British government that he could help prevent the establishment of a communist government in Italy, thus avoiding any prosecution for war crimes over what happened in Ethiopia. He died in 1956 at the age of 85, having returned to his home village. He is buried at the village cemetery. The Royal Military Academy in Turin, where Badoglio trained, was the oldest military academy in the world, dating back to the 17th century, when Duke Carlo Emanuele II of Savoy had the idea of creating an institute to train members of the ruling class and army officers in military strategy. It was inaugurated on January 1, 1678, which predates the Royal Academy at Woolwich in Britain by 42 years and the Russian Academy in Petersburg, by 45 years. The court architect Amedeo di Castellamonte designed the building, work on which began in 1675, which was situated a short distance from the Royal Palace in the centre of the city. Unfortunately, the building was almost totally destroyed in 1943, during Allied air attacks. The hilltop village of Grazzano Badoglio, which was Grazzano Monferrato until 1939, is situated about 80km (50 miles) to the east of Turin in the province of Asti . In was renamed by the Fascist mayor in 1939 in honour of Pietro Badoglio. The house where Badoglio grew up, which became an asylum in 1937, is marked with a commemorative plaque. The village, which had Roman origins, is notable today for the Abbey of Aleramica - today the village’s parish church - which was founded in 961 by the Marquis Aleramo I of Monferrato on top of the hill where the church stands today. It was home to Benedictines monks for more than four centuries. The cloister, restored and open to the public by request, is among what remains of the original building. The Romanesque bell tower was added in 1910.